The spring season brings relatives and friends together for holidays, graduations, and family celebrations, and the dining table is often set with a special selection of china for the occasion. The Lincoln family followed this tradition in their family and presidential homes. In one of her first official duties after becoming First Lady in 1861, Mary Lincoln ordered a full set of presidential china to be used for White House functions. Mary came from the prominent Todd family of Lexington, Kentucky, where formal entertaining and social status were of great importance. The Todd family welcomed family, friends, and prominent political leaders to their table, which was beautifully set for dining. Upon her arrival at the White House, Mary was very disappointed with the inventory of White House china. She felt that the limited selection of disparate china services from previous presidents was inadequate for presidential entertaining, and she set out to replenish the White House china cabinets. Working through the firm of E.V. Haughwout and Company in New York City, she selected Haviland and Company of France to produce a set of dinnerware for presidential use. She specified that the white porcelain was to have a scalloped edge, a hand painted solferino (red-purple) and gold rope border. The white center ground was to be decorated with clouds, superimposed with patriotic imagery of an American bald eagle with wings outstretched, holding arrows and olive branches in its talons, standing atop a shield with stars and stripes, and entwined with a banner bearing the national motto “E Pluribus Unum.” At the same time, Mary ordered a similar set of Haviland china for Lincoln family use. The family china was also white porcelain, with a bright pink border, hand pained with Greek key-style gold decoration and the initials “ML”. The solferino-bordered presidential china, dubbed the “Royal Purple” set, was greatly admired. It was so well-suited for official White House use that subsequent presidents ordered additional pieces to augment the original Lincoln purchase. The design of the Lincoln Presidential China remains popular today. 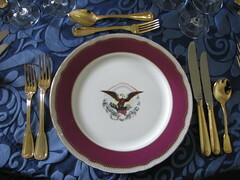 For those wishing to dine in Lincoln style, The Woodmere Company of Pennsylvania has produced a modern version of the “Royal Purple” china very similar to that used by the Lincolns. This replica version of the Abraham Lincoln Presidential China is available for use by guests dining at President Lincoln’s Cottage. 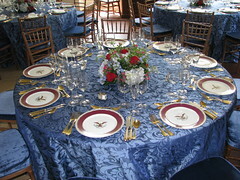 Both the Cottage and the Robert H. Smith Visitor Education Center may be rented for private and corporate events, and many hosts have chosen to enhance the “Lincoln experience” of their guests by renting Royal Purple china and serving a menu inspired by Abraham Lincoln’s favorite foods. The sumptuous table settings and special menus prepared by the superb caterers on the site’s Preferred Vendor List have made events at this historic site particularly memorable. You, too, can dine in presidential style at President Lincoln’s Cottage! The Cottage offers intimate dining space for 10 to 20 guests in the Lincoln family Dining Room, and more extensive dining space for up to 100 guests on the second floor. Learn more about the Site Rental Program at President Lincoln’s Cottage.